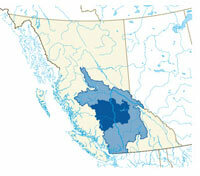 The Cariboo-Chilcotin covers 70,000 km2 of BC’s Central Interior. The region features varied topography, abundant wildlife and spectacular landscapes — from craggy peaks. to cedar-hemlock forests, to grasslands. The Cariboo falls in the Interior plateau, east of the Fraser River, and the Chilcotin lies west of the Fraser. About 62,400 people lived in the region (2.1% of the Basin’s population) as of 2011. The Cariboo-Chilcotin is known for its gold rush history, western lifestyle and rugged individualism. In addition to historic towns, the region has spectacular scenery, outdoor adventure and a growing number of amenities for both residents and visitors. And when it comes to adventure, the choices are outstanding — horseback riding in the Chilcotin Mountains, canoeing on Bowron Lakes, backpacking in Wells Gray Park, whitewater rafting on the Chilko River, cross-country skiing near 100 Mile House and riding or relaxing at guest ranches and spas. The region includes the City of Williams Lake, City of Quesnel, District of 100 Mile House and District of Wells, as well as many smaller communities, such as Alexis Creek, Horsefly, Likely, Lac La Hache and Barkerville. All are within the Cariboo Regional District. This region is the traditional territory of Dakelh, Secwepemctsin and Tsilhqot'in-speaking peoples. First Nations of these language groups include Kluskus, Red Bluff, Nazko, Ulkatcho, Canim Lake, Canoe Creek, Esketemc, Soda Creek, Williams Lake, Alexandria, Alexis Creek, Stone, Tl'etinqox-t'in Government Office, Toosey and Xeni Gwet'in Government. Regional First Nations bodies include the Northern Shuswap Treaty Society and Tribal Council, Carrier Chilcotin Tribal Council and the Tsilhqot’in National Government. The boundaries of the Cariboo-Chilcotin region are based primarily on watersheds, including the Quesnel, West Road/Blackwater, Chilcotin, and Bridge-Seton watersheds and part of the Middle Fraser River. To learn more, see About the Basin. Today’s Cariboo economy is built on a base of ranching, agriculture, mining, forestry and tourism. The forest industry is taking steps to recover strength in the face of significant challenges — including softwood trade issues in the US and the mountain pine beetle infestation, which has devastated much of the region’s lodgepole pine forests. Economic diversification is of great importance to this region — and this is reflected in such innovations as mountain-bike tourism in Williams Lake and Wells-Barkerville, new agricultural products, including hemp, and a well-respected log homes industry.The Cariboo Regional District was named the Forest Capital of Canada for 2010-2011 by the Canadian Forestry Association in recognition of its promotion of value-added wood products and bio-energy. FBC tracks sustainability indicators across the Fraser Basin. You can find past regional highlights in our 2009 Sustainability Snapshot.